Mr. and Mrs. Kenneth James Duke of Houston are pleased to announce the marriage of their daughter, Alyssa Marie Duke, to John James Saxon, son of Mr. and Mrs. John Scott Saxon of Baton Rouge. They were wed Oct. 7, 2017, at 6:30 p.m. at Our Lady of the Rosary Catholic Church in New Orleans. The double ring ceremony was officiated by Fr. Robert Cooper. The bride is the granddaughter of Mr. and Mrs. William Kitto of Chalmette and the late Mr. and Mrs. Henry W. Duke. She is the great-granddaughter of the late Mr. and Mrs. Maurice Miranda. The groom is the grandson of Mr. and Mrs. James R. Pleasant of Baton Rouge, Mr. and Mrs. David Carey of Baton Rouge, Mrs. Janie Saxon of Baton Rouge and the late Mr. Walter Saxon. He is the great-grandson of Mrs. Barbara Jo Ruggiero of Marthaville, the late Anthony Ruggiero and Mr. and Mrs. Jimmy Pleasant. The church was decorated with white hydrangea bouquets tied with tulle. The music for the seating of the parents and grandparents was Jesu, Joy of Mans Desiring by Bach. The wedding processional entered to Water Music-Air by Handel, Canon D by Pachelbel and Wedding March by Mendelssohn. The bride wore a Justin Alexander signature gown accented with ivory Chantilly lace and long lace sleeves. The gown had a trumpet silhouette and royal train. The floor length veil was in ivory tones with a blusher. Her bouquet consisted of fresh clusters of blush dahlias, vanilla and blush roses, spray roses, rose-gold colored seeded eucalyptus and Italian ruscus, fully wrapped in ivory satin. Danielle Marie Weber was the Maid of Honor. The bridesmaids were Jillian Taylor Bass, Jessamine Parish Kitto, Ashley Elaine Schiro, Amber Blair Talmage and Abby Alyssa Wimberley and the junior bridesmaid was cousin of the bride, Miranda Elizabeth Weeks. They wore gowns of various designs in blush pink. Collin Scott Saxon, brother of the groom, was the Best Man. The groomsmen were Matthew Blane Mitchell, brother of the bride, Nicholas Bridges Caletri, Ethan Edwin Caubarreaux, Bryan Alan Hood, Philip James McMahon and Christopher Aaron Rome and the junior groomsman was cousin of the bride, Alexander Hilton Weeks. Brother of the bride, Dustin Duke, escorted the mother of the bride and the gift bearers were Gary and Jeannie Duke. The groom’s parents hosted a rehearsal dinner prior to the ceremony at Dickie Brennans Bourbon House in New Orleans. 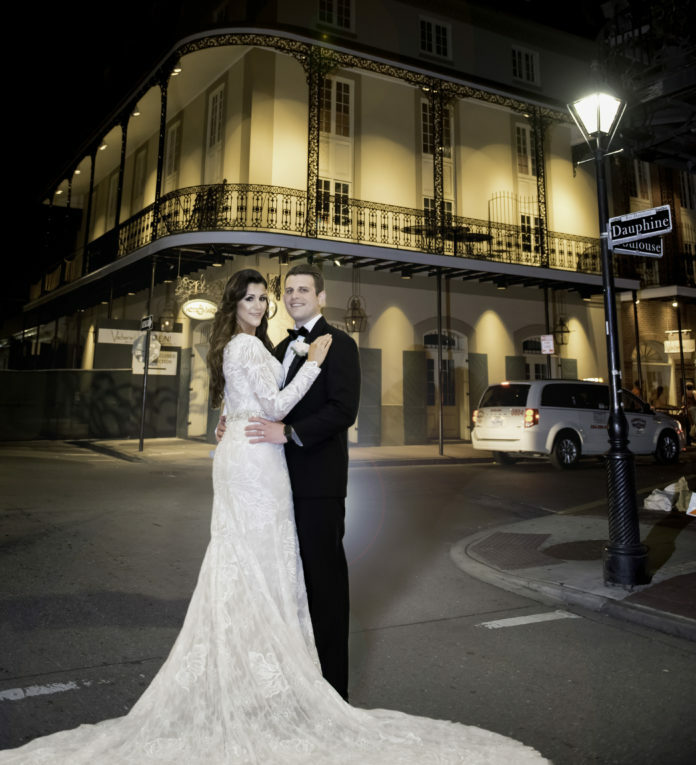 The reception took place at Hotel Monteleone in New Orleans. The venue had tables decorated with ivory linens adorned with floral arrangements of white hydrangeas and baby’s breath. Around the room, there was blush uplighting by Grooves Entertainment and a photo booth by Spoofs. The Top Cats, a New Orleans premier cover band, provided the music. Alyssa is a graduate of the University of Louisiana at Lafayette and has a Bachelors in Child and Family Studies, with a minor in Psychology. She is a member of Phi Mu Sorority and is pursuing her Master’s degree in Criminal Justice at Sam Houston State University. Alyssa is employed with Cleary, Gottlieb, Steen & Hamilton Attorneys. John is a graduate of the University of Louisiana at Lafayette and has a Bachelors in Finance with the School of Business. He is a member of Pi Kappa Alpha Fraternity. John is employed as a financial analyst with Goldman Sachs in New York City. After a honeymoon in St. Lucia, the couple has made their home in New York City.